There I was, working for Andrew Ng, known for his research in machine learning and computer vision. 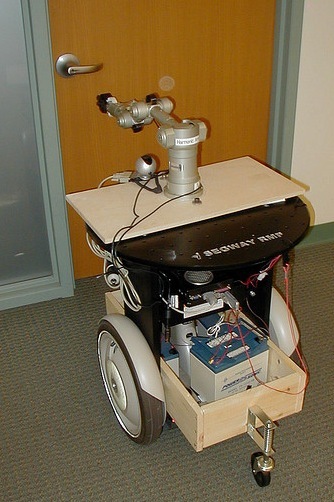 I was lead on Stanford AI Robot (STAIR), getting the project off the ground and teaching the robot to wheel around Gates and open doors with its robotic arm. Needless to say, I was very fortunate to have an interesting project. And yet something was missing. As Larry Smith said, “What you want is passion–it is beyond interest“. There I was, having a quarter-life crisis. I don’t have an accent and though from time to time I talk like a fob or a banana for fun, my parents did a pretty good job raising me in the Chinese tradition balanced by America’s progressive values. In high school, my weekends were mostly spent studying for the SATs and when my parents weren’t looking, playing the original Quake on a 13-inch CRT. When I wasn’t in China visiting family during the summers at Yale, I worked at research labs on things like Molecular Electronics and the Autonomous Vehicles. I didn’t do internships in industry because that wasn’t in the plan. The plan was to get that Ph.D. because in Chinese culture, the degree is king. In a culture whose recent history rewarded political office to the best scholars and with it a life of fame and fortune, this mindset is hard to shake. There I was, fulfilling the plan but not the passion. So I took baby steps. I worked on a few startup projects with friends and acquaintances and learned a bit of Ruby on Rails, which was in its toddlerhood (1.0, baby!). I wanted to build things that had impact right then–I knew I had at least a few decades to wait until robots would advance beyond glorified vacuums. I tried to read about the startup life but barely scratched the surface. To be honest, I didn’t really prepare myself properly. I had the comfort of graduate school to cushion me while I did some part-time work for a company called Howcast. One day I was working from home part-time and the next day I was “WFH” full-time. I still played basketball with my grad school buddies after work. There I was, a newly minted startup guy. There are many reasons not to join a startup so back then I listed many of them to myself. People with young children or other family responsibilities. Nope, I left that box unchecked. People who can’t handle high-stress or high-intensity situations. Nope, my personality craves andrenaline–like playing FPS for 16 hours straight w/o a bathroom break or popping a few Lactaid pills before doing the Milk Challenge. Ultimately, this was a lame game to play and since “everyone was doing it”, I definitely got sucked in by the hype as well. Here I am, a startup guy. I can tell you that you’ll learn so much more and have so much more responsibility at a startup, but that may not always be true. I can tell you that the potential rewards are greater than the risks, but I won’t go on the record with that. I can tell you that you’ll have more impact than teaching or working at a big company but that’s not a truism either. When you’re in a quarter-life or mid-life or three-quarters-life crisis, it’s a “solution” you’re looking for. It’s the sign in the road that says “Happiness 42 miles”. Well, there were budget cuts and those signs were never installed. No path to follow, no one end result to optimize for. And guess what, startup life may or may not be for you. It’s like saying, “Surprise! You’re on the Truman Show!” My reasons have changed over time but one thing hasn’t really changed. Here I am, a guy who isn’t ever bored for long.